The 'Spark of Love' Toy Drive is a partnership of Southern California Firefighters, the U.S. Marine Corps Reserve and ABC7. The Los Angeles Fire Department is proud to partner with Southern California Firefighters, the U.S. Marine Corps and ABC7 in the Annual Spark of Love / Toys for Needy Children program. The Annual Spark of Love toy program officially kicked off the day after Thanksgiving. 'Stuff-a-Bus' is consistently the most successful single-day event in gathering toys to bring smiles to children across Southern California. The 2018 'Stuff-a-Bus' event is taking place on Friday, December 7th at Walmart 'Harbor-Gateway' (19503 Normandie Av, 90501).Your LAFD along with ABC7 and members of the United States Marine Corps will be there from 4:00AM until 6:00PM and can't wait to see you. Spark of Love is only possible due to the on-going generosity of thousands of people in our communities across the region. We are so very grateful and thank every person. 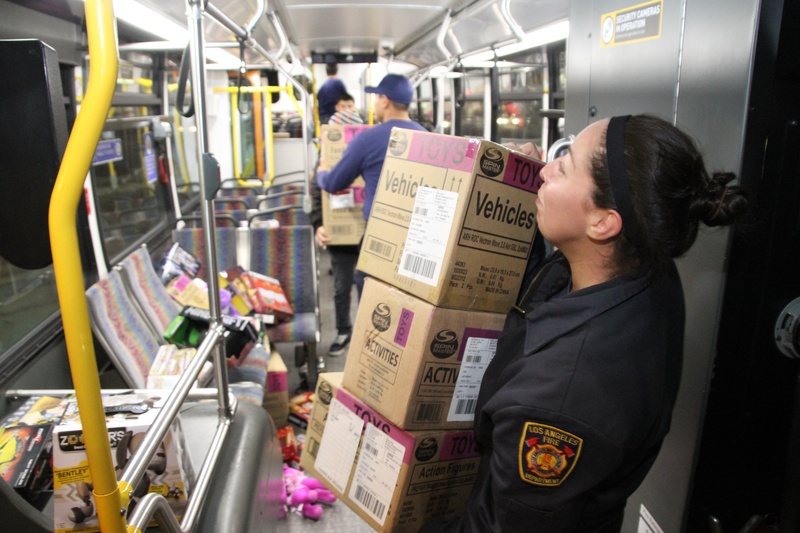 If you're not able to make it out to Stuff-a-Bus today you can bring new, unwrapped toys and sporting goods to any neighborhood fire station in the City of Los Angeles (locate your nearest station HERE). Additional special events for toy collection will also be announced by the LAFD, United States Marine Corps Reserve and ABC7 through the holiday season. A 24-hour Spark of Love information hotline has been established at (213) 847-3816, with instructions on how non-profit community organizations can register to receive toys for children in need. Individual families in need of toys must contact a non-profit organization in their community that can officially participate in the program, such as a school, house of worship, park, boys and girls club, philanthropic or service club with a registered 501(c)3 status. Such non-profit organizations interested in obtaining toys through Spark of Love, should send an email to: LAFDtoys@gmail.com. A 2018 Toy Request Application will be sent in reply, which can be quickly completed on-line via a desktop computer. Because Spark of Love depends on the generosity of our community, the Los Angeles Fire Department cannot guarantee toy delivery or forecast event participation. For more information, call (213) 847-3816.